Bahá'í gardens can be found at Bahá'í Holy Places in Israel and elsewhere, and at Bahá'í Houses of Worship. Many Bahá'í holy places in Haifa and around Acre, Israel were inscribed on the World Heritage List in July 2008. Below a description of the most important gardens is given. The Terraces of the Bahá'í Faith, also known as the Hanging Gardens of Haifa, are garden terraces around the Shrine of the Báb on Mount Carmel in Haifa, Israel. They are one of the most popular destinations for visitors to Israel. The architect is Fariborz Sahba from Iran, the structural engineers are Karban and Co. from Haifa. The gardens have elements of the Persian gardens of Shiraz, Iran, the Nishat Bagh gardens of Kashmir, India and English gardens, isolating the site from the noise of the surroundings and connecting the different Bahá'í buildings on Mount Carmel together. The Monument Gardens, set within the Arc gardens at the Bahá'í World Centre on Mount Carmel, are a set of gardens which hold the graves of some of the members of the Bahá'í holy family. The Mansion of Bahjí (Arabic: delight) is a summer house near Acre, Israel, where Bahá'u'lláh, founder of the Bahá'í Faith died in 1892. His shrine is located next to this house. The whole area was called Al-Bahjá (Place of Delight). The site has since been beautified with paradise gardens, which are called Haram-i-Aqdas (the Most Holy Precincts or Sanctuary) and are intersected by a circular path which serves to circumambulate the shrine. The Mansion, shrine, and surrounding gardens are among the most sacred spots on earth for Bahá'ís and are Bahá'í pilgrimage sites. The Shrine of Bahá'u'lláh is composed of a central area that contains a small, tree-filled garden surrounded by paths covered with Persian rugs. A glass roof was constructed by Qulám-‘Alíy-i-Najjár after the death of Bahá'u'lláh. At the northwest corner of the central area there is a small room where Bahá'u'lláh's remains are laid to rest. The Garden of Ridván (lit. 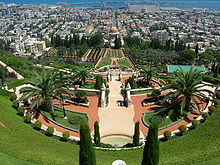 garden of paradise) is a Bahá'í holy place situated just outside Acre. Originally known as the 'garden of Na‘mayn', it was rented by `Abdu'l-Bahá (Bahá'u'lláh's son) for Bahá'u'lláh where he enjoyed spending the later part of his life, after years in a desolate prison cell. Although it shares the same name it does not have the same significance of the Garden of Ridván in Baghdad and no connection to the festival of Ridván. During the 1930s and 1940s the island setting of the garden disappeared, as a result of a draining project against malaria. In 2010 a three year restoration and conservation project of the garden and the original water canals surrounding it was completed, after which the Ridvan Garden, referred to by Bahá'u'lláh as 'Our Verdant Isle', became an island once again. The Garden of Ridván or Najibiyyih Garden was a wooded garden in what is now Baghdad's Rusafa District, on the banks of the Tigris river. It is notable as the location where Bahá'u'lláh stayed for twelve days from April 21 to May 2, 1863, after the Ottoman Empire exiled him from Baghdad and before commencing his journey to Constantinople. During his stay in this garden, Bahá'u'lláh announced to his followers that he was the messianic figure whose coming had been foretold by the Báb. These events are celebrated annually during the Festival of Ridván. Bahá'í House of Worship, sometimes referred to by its Arabic name of Mashriqu'l-Adhkár ("Dawning-place of the remembrance of God"), is the designation of a place of worship, or temple, of the Bahá'í Faith. All Bahá'í temples are surrounded by gardens. ^ World Heritage Committee (2007-07-02). "Convention concerning the protection of the world cultural and natural heritage" (PDF). p. 34. Retrieved 2008-07-08. ^ Momen, Moojan (2009). "Bahá'í World Center". Bahá’í Encyclopedia Project. Evanston, IL: National Spiritual Assembly of the Bahá’ís of the United States. ^ Viswanathan, G. M. (1994-07-24). "Bahá'í Aesthetics of the Sacred". bahai-library.com. Retrieved 2006-08-12. ^ `Abdu'l-Bahá (1915). Memorials of the Faithful. Wilmette, Illinois, USA: Bahá'í Publishing Trust (published 1997). p. 144. ISBN 0-87743-242-2. ^ Manvell, Christ (November 1996). "Visits to the Shrine of Bahá'u'lláh and Meeting with the members of the Universal House of Justice". bahai-library.com. Retrieved 2006-08-12. ^ For pictures of the central room and the inner shrine, see The Bahá'í World, Vol III, p. 5 and 11. ^ BWNS: Holy place restoration sheds light on region's heritage 29 October 2010. ^ a b Walbridge, John (2005). "Ridvan". Sacred Acts, Sacred Space, Sacred Time. Oxford, UK: George Ronald. ISBN 0-85398-406-9. Wikimedia Commons has media related to Bahá'í gardens. "The Bahá'í Gardens - Official Website". Bahá’í World Centre. 2012-02-27.